Swiss tennis player Roger Federer has finally managed to win a French Open title, after beating Sweden’s Robin Soderling in the final at Roland Garros Sunday. The clay-court Grand Slam — the only one to have eluded Federer so far — was his 14th major title, and completes his “career Grand Slam” by winning all four Grand Slam events (Wimbledon, the Australian Open, the U.S. Open, and the French Open). The 27-year-old becomes just the sixth player in men’s tennis history to complete the career Grand Slam, and in doing so has confirmed himself as one of the greatest players of all time. Andre Agassi was the last player to complete a career Grand Slam. Debate: Is Roger Federer the greatest tennis player of all time Federer won the match in straight sets, however, it was still a valiant effort from the 23rd seed Soderling, who knocked out the previously unbeaten (at the French Open) world number one Rafael Nadal. 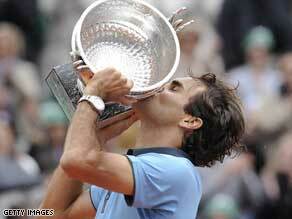 Federer eventually claimed the victory hitting 16 aces and 41 winners. View our photo gallery » of how the final happened, and tell us if you think Federer is now the greatest player in tennis history in the Sound Off box below.